Hi all, it's Gwen back with this month's edition of Gwen's Gems! For today's project, I wanted to go back to a series I've been working on for a few years where I use stencils as patterns for 3D artwork, but this time I wanted to do something a bit different than a sculpture; I decided to do a new take on the boho fish that I've been making for the last year or so - something much more dimensional that would give me some new options for embellishment. With that in mind, I made this 12"x16" cradled mixed media panel with 3D collaged boho fish. I put together a tutorial with some photos I took as I worked so that you can see how I made it. 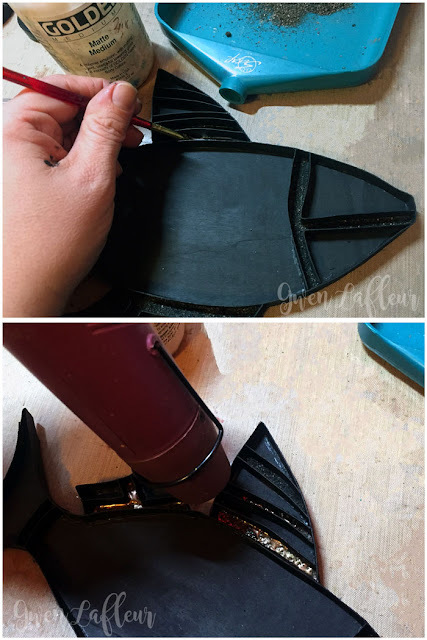 While this may not be something you want to reproduce exactly, hopefully there are some fun and useful techniques in here! On the photocopies, I traced the printed lines with a charcoal pencil and then transferred the design onto thin cardboard by rubbing over the back firmly with a bone folder. 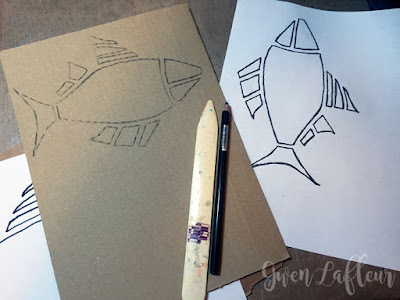 I cut out the outline of each fish, and then took very thin strips of chipboard and cut, curved, and bent them to match up with the lines of the stencil design. I used PVA glue in a Finliner bottle to apply each piece of chipboard to the base. This is, as you can imagine, a bit tedious, but I just turned on the hockey game and worked and watched / listened, and the time flew! (Plus, my team won which made it even more fun!) 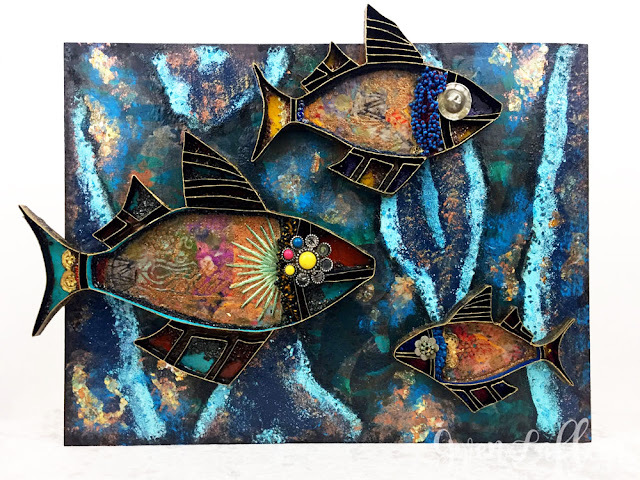 I repeated this for each of the three fish. Once all of the sections and joins were dry, I painted each fish with black gesso, inside and out - making sure to get into all of the cracks and corners. From there, it was time to start the collage part of things. 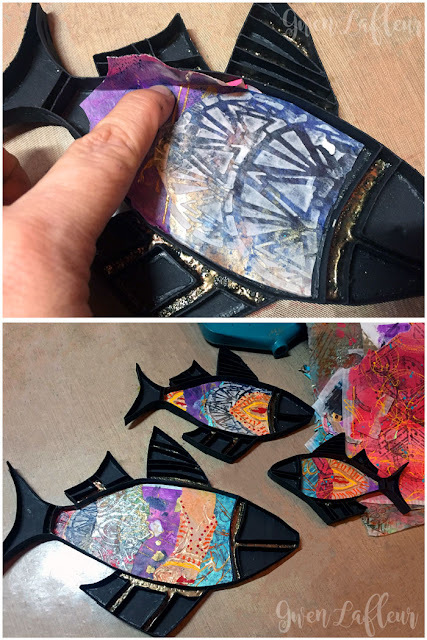 In the largest area of each fish, I pulled out my collage and scrap papers and layered pieces of them until I liked the way it looked. You can see here that I just pressed them into the tray and used my fingernail to mark the line with a good crease, then cut it out. I knew I was going to cover up the edges, so it was okay if it wasn't perfect. Most of my collage papers have stenciling on them, of course! 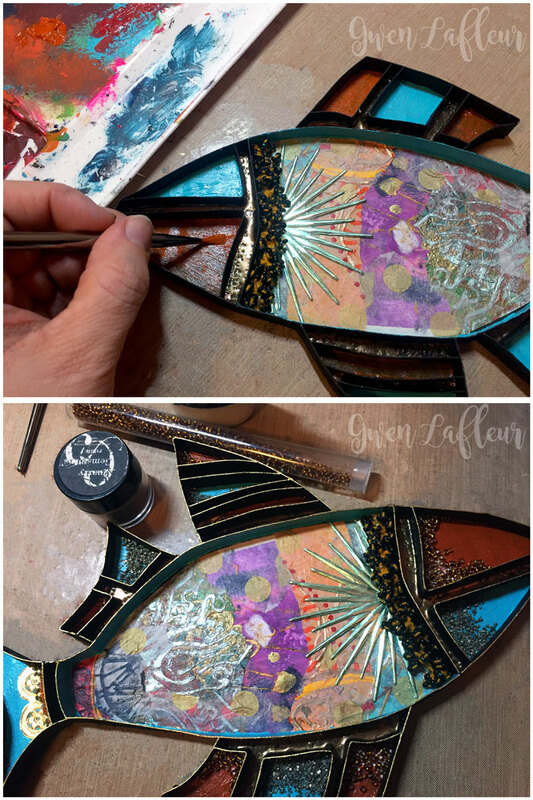 Here you can see my Art Deco Borders stencil, my Art Deco Sunburst Background stencil, the Decorative Medallion, my Art Deco Sunburst Medallion, and the Nosegay stencil by Cecilia Swatton. Next, I added some paint to a few of the empty sections, and started adding in embellishments like some beaded Kuchi trim and Dresden trim. 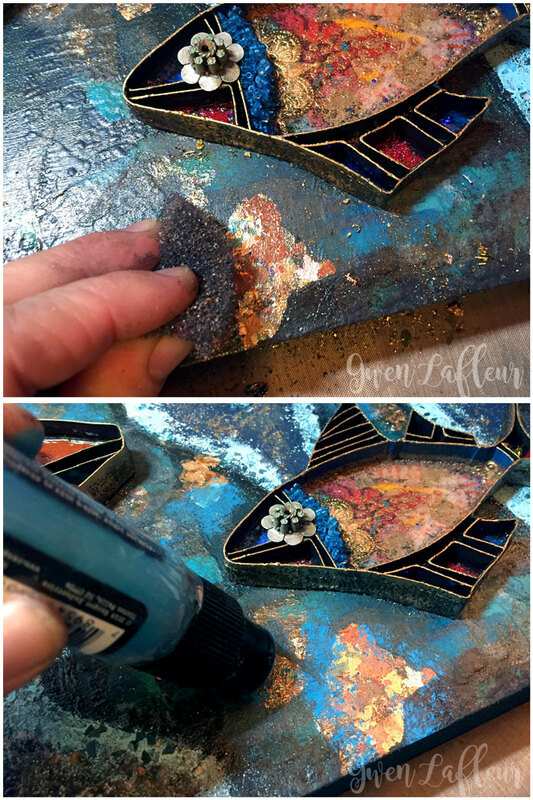 When the painted sections were dry, I put down some glue and added some fun little bits, like seed beads, microbeads, and chunky glitter. 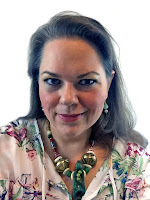 I also found a few broken pieces of Turkmen jewelry that I thought would work well for eyes and glued those into place. 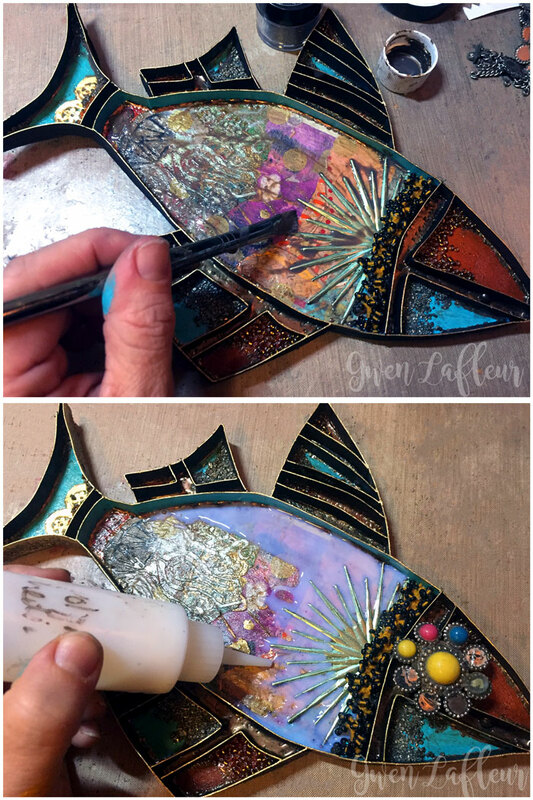 To cover up any gaps between the collage papers and the sides of the fish, I used a Versamark pen and Emerald Creek embossing powder to cover it up so that it almost looked soldered. 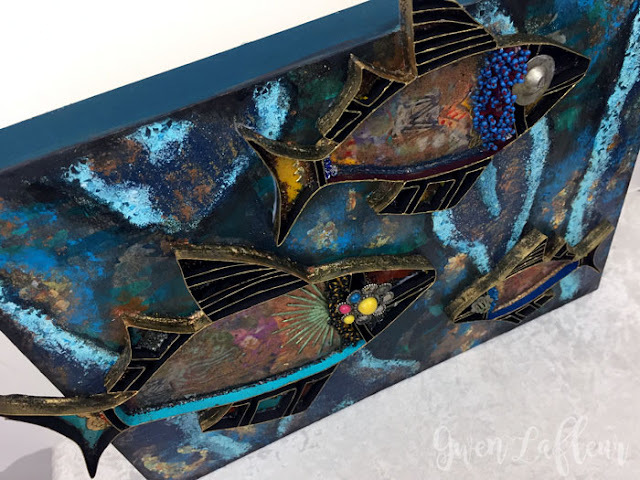 I added a brown glaze over the larger sections, then when it was all dry I flooded it with gloss medium (Golden used to call it Polymer medium and I believe Liquitex calls it Pouring medium.) I set these aside on a level surface and let them dry overnight. 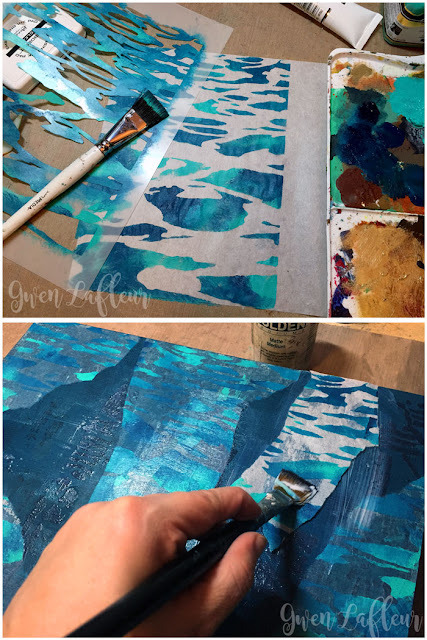 Next I took out two sheets of rice paper and a few shades of blue and teal paints and stenciled Trish McKinney's Ripple Effect stencil to be used for collage over top of the embossed background. 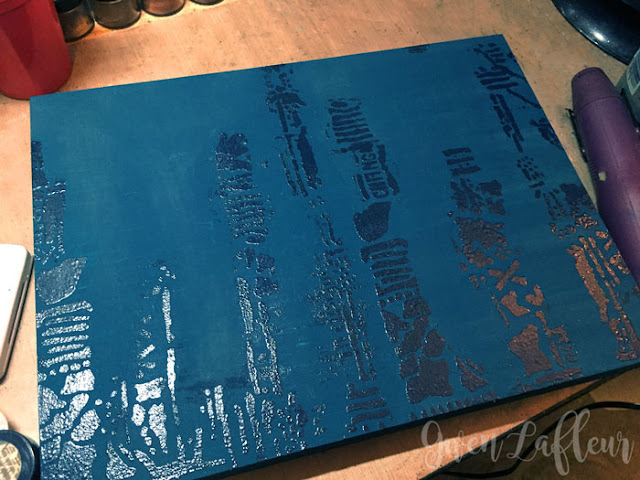 When it was dry, I tore sections off and layered them over the panel, adhering with matte medium and pressing quite firmly to make sure there were no bubbles. I set this aside to let it dry for a while. Next I came in with a few colors of embossing powder and just added larger swaths of color - I wanted something that looked very natural - a bit like a rock formation. 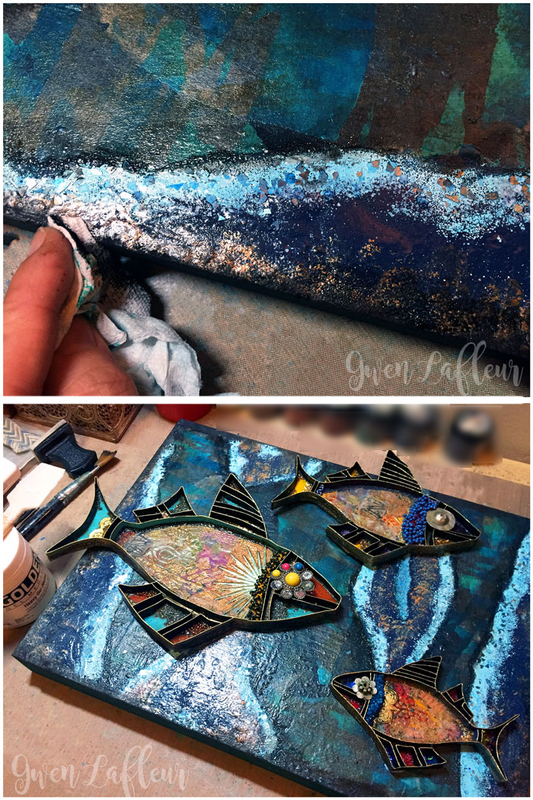 On one of the layers I embedded some chunky glass glitter by heating a small section until it was liquid, moving the heat gun away and quickly sprinkling in a bit of the glitter, then bringing the heat back to seal it in place. 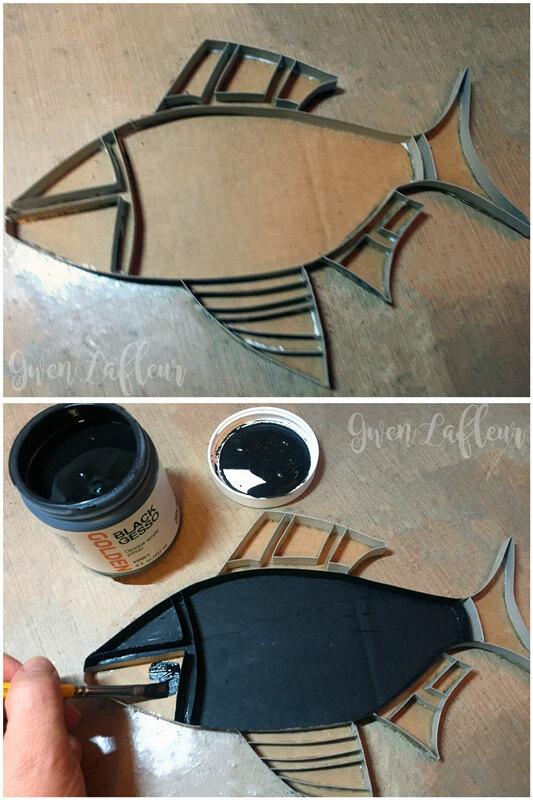 I dabbed a bit of gold and bronze paint over the embossed areas to get a metallic touch - I really liked the effect! I finished the edges of the panel with some black wax, then used a heavy gel medium to adhere my fish into place on the top and let that dry for a few hours. I felt like it still needed a bit more, so I used some gilding paste and gold leafing flakes to add a bit more detail, then used some acrylic paint daubers to integrate those areas into the background. I had so much fun making this piece, and I hope you enjoyed it as well, and maybe even picked up a few ideas that you'd like to try yourself! If you try this at home, I'd love to see how it turns out! Thank you for your labour of love in creating the fish, and the brilliance of colours, materials, and explanatory writings. 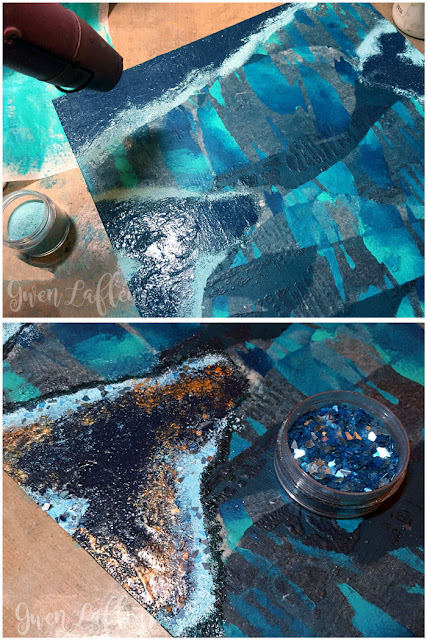 I love it when stencils go waaaay away from the journal page/card. Thank you so much - I really appreciate it! 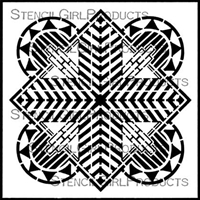 One of my favorite things to do is to find ways to take stencils way outside the box, so this was a lot of fun. 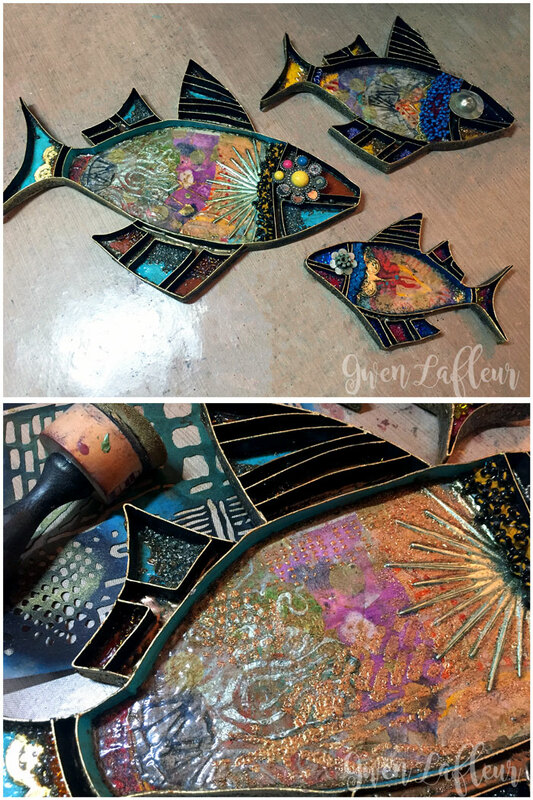 Love the way you turned the stencils into the dimensional fish! Thanks for sharing the steps and “how-to”. Just gorgeous! Thank you Amy - I really appreciate it! Wow! Spectacular piece Gwen. You always find a new way to see things. Pretty awesome and some great new techniques to try! This turned out fabulous. Thank you Jill! I hope you give it a try - I'd love to see what you do! This is amazing - and beautiful! Oooo I am spellbound. Super fabulous! 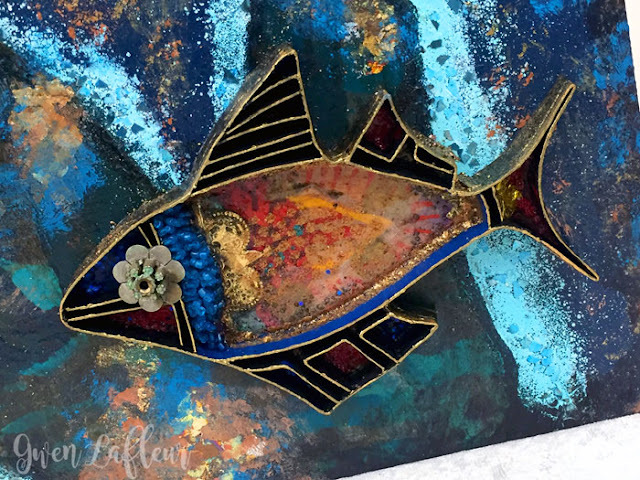 Thanks so much Peg - so glad you like it! 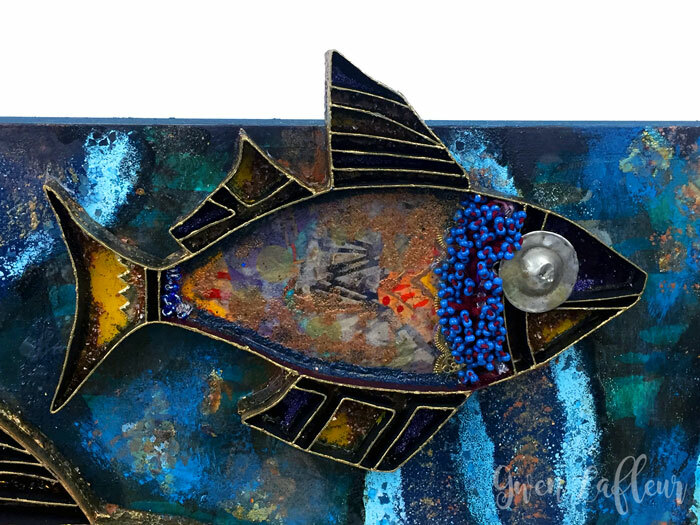 I love the dimension of the fish and all that yummy texture adds to the beauty as well. 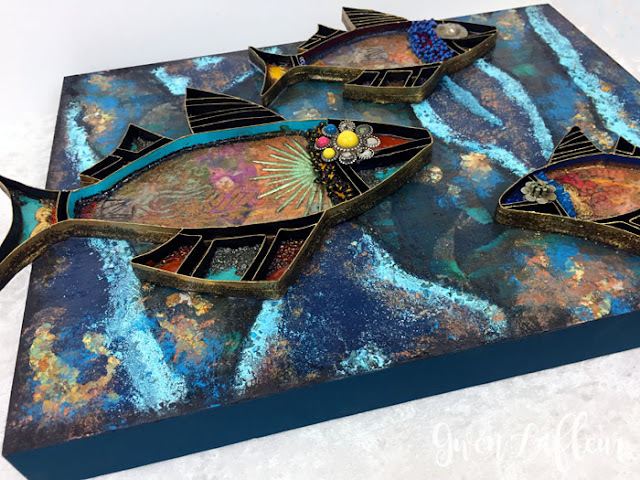 Wonderful piece! You're blowing my mind! I cannot imagine the patience it takes to create the chipboard parts. They are remarkable. 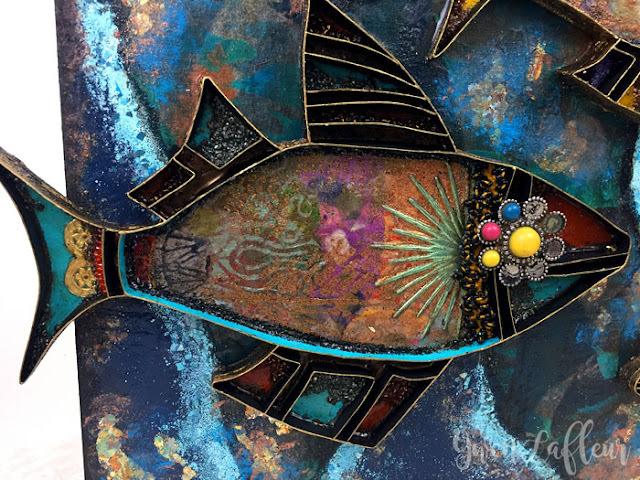 The embellishment is stunning. You certainly know how to raise the bar. Thanks so much Lynda! It doesn't take all that long... maybe I'm weird, but it's kind of a zen-like activity for me. lol. This is beyond stunning Gwen. Clever, creative and sooooooo cool. Your art is never a disappointment, love it!